Dermatologists such as Joel Schlessinger MD strive to refute myths about sunscreen. In a recent online article, Reader’s Digest brought to light ten popular myths about sunscreen that many consumers still believe. Unfortunately, these myths often encourage individuals to skip sunscreen application, which can cause serious sun damage and skin cancer, according to Joel Schlessinger MD. Setting the record straight regarding these myths is one of the most effective ways to spread awareness about sun safety. Misconceptions about tanning, skin cancer and UV damage can lead to harmful sun exposure, explains Joel Schlessinger MD. Popular myths include the belief that having a darker skin tone or receiving a base tan will protect against sun damage. Individuals with dark skin tones are still at risk for developing skin cancer and must wear sunscreen to protect their skin. Many believe that tanning is less dangerous than burning, however, a tan still indicates that the skin has been injured by UV rays. Many individuals also believe that only their faces need to be protected or that sunscreen only needs to be applied during peak hours of the day. Both of these myths are untrue. Dangerous sun exposure can occur at any point during the day and anywhere on the body. 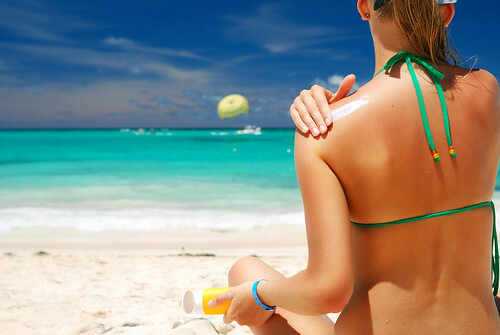 Consumers should be aware of the truth behind myths about sunscreen, says Joel Schlessinger MD. The debate over SPFs often leaves consumers confused about exactly which products they should be using. Many dermatologists agree that reapplying every two hours and using a minimum of SPF 30 is the best way to go. Debates about the efficacy of sunscreen ingredients have also led to several myths about sun protection products. Many consumers believe that the chemicals in sunscreens are dangerous and that they can cause allergic reactions. With physical, mineral and chemical options available, however, it is easy for consumers to find a product that works for them. Are you concerned about some of the facts or myths you’ve heard about sunscreen? Ask Joel Schlessinger MD in the comment section below and find out the truth. To reveal a brighter smile, Joel Schlessinger MD recommends this advanced whitening tool. Teeth whitening is becoming more and more popular as advances in technology become available. Rather than paying for expensive procedures at the dentist’s office, patients can now use at-home teeth whitening systems such as the Pearl Ionic Whitening System to achieve professional results. In this presentation, Joel Schlessinger MD describes the technology behind this device, how to use it and what results you can expect. How does this device work? Joel Schlessinger MD explains. Over time, teeth can yellow or darken as a result of foods and drinks such as coffee, tea and red wine. Smoking and using other tobacco products can also affect the color of your teeth. The Pearl Ionic is a hand held device that is used for five minutes twice a day to erase these stains. The ionic technology activates hydrogen peroxide in the whitening gel to lighten and brighten tooth enamel. This tool is enamel-safe and provides professional results without causing irritation or sensitivity. Depending on your daily habits, these results occur in only five days and can last for weeks. Joel Schlessinger MD explains how to determine which whitening system is right for you. You can choose between two whitening systems when you purchase a Pearl Ionic device. The Pearl Ionic Gentle Whitening System – Gentle White is proven to whiten teeth seven shades and is ideal for first-time users. The Pearl Ionic Teeth Whitening System – Brilliant White whitens teeth up to ten shades for advanced results. Both devices require 50 minutes of treatment time over the course of five days. To maintain your smile, you can touch up by using this device every three months or as needed. Enjoy more presentations from Joel Schlessinger MD on SlideShare. Can stress really turn your hair gray? Joel Schlessinger MD explains. A recent study shows that stress may have a link to an increase of graying hair. According to a recent study published in Nature Medicine, the appearance of gray hair could be caused by periods of stress or skin damage. The study’s findings may also lead to new methods of treatment for pigmentation disorders such as vitiligo or piebaldism. Joel Schlessinger MD shares the science behind this study. Hair and skin both receive their pigment from melanin, which is produced by melanocytes. These melanocytes are created by stem cells at the base of the hair follicle. When the skin is stressed or damaged, these stem cells migrate to repair damage, leaving the follicle without its own supply of melanocytes. The surprising part of this study is that, contrary to previous findings, the stem cells migrate without replicating first. Without the ability to produce melanin, the hair follicles turn white. This link could lead to improved treatments for other skin conditions, according to Joel Schlessinger MD. 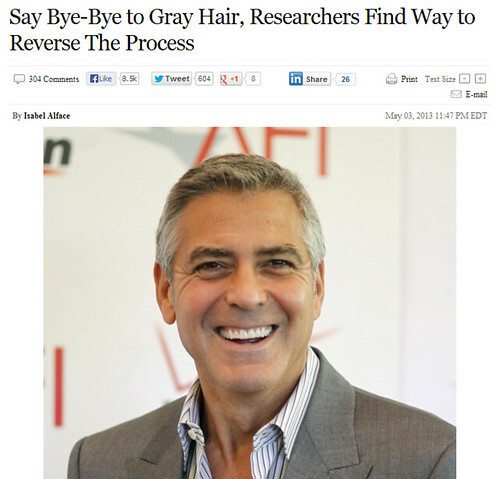 Gray hair during aging is caused by exhaustion and the loss of melanocyte-producing stem cells. Stress can cause these stem cells to migrate faster, leading to an earlier appearance of gray hair. Additional research needs to be done, but these new findings could provide a better understanding of skin conditions that have troubled dermatologists for years. More information about how stem cells migrate might even lead to improved treatment of vitiligo (depigmentation of the skin) and hyperpigmentation (an excess of pigment in the skin). What do you think of these findings? Share with us in the comments. Cleaning your makeup brushes should be a regular part of your routine, says Joel Schlessinger MD. Makeup brushes can be home to dirt, oil, debris and buildup that can seriously aggravate and harm your skin. Cleansing your tools regularly is the best way to prevent this buildup from causing problems such as acne and blemishes. Not only does regular sanitizing kill bacteria, it also helps your brushes last longer and provides you with the best makeup application. In this presentation, Joel Schlessinger MD reveals his best practices for cleaning brushes as well as his top product choices for your routine. Sanitizing brush cleansers are the best choice for cleaning your makeup tools, explains Joel Schlessinger MD. You should cleanse your brushes once a month using a cleanser such as Colorescience Pro Brush Cleanser, jane iredale Botanical Brush Cleanser or glo minerals Brush Cleaner. These products remove cosmetic buildup as well as bacteria, dirt and oil that brushes collect from your skin. To use these cleansers, simply spray directly onto brushes or a cloth and then wipe brushes to remove dirt and buildup. You can also use a product with natural ingredients such as Eminence Natural Brush Cleanser. This product uses natural extracts to sterilize brushes and promote a healthier complexion. The gentle formula also contains conditioning ingredients that maintain soft and fluffy bristles. Joel Schlessinger MD also recommends replaceable brush heads to maintain healthy skin. Along with regular cleansing, your brushes should be replaced after frequent use. The Klix brushes are a line of cosmetic tools that allow you to replace brush heads quickly and on the go. The brush heads come in a variety of sizes for different cosmetic needs and the soft texture allows for flawless makeup application. Stay tuned for more skin care and beauty tips from Joel Schlessinger MD. Treating high risk skin cancers on the face requires special care, explains Joel Schlessinger MD. While most individuals are getting smart about sun protection and wearing a daily sunscreen, skin cancer is still a huge concern for many individuals. When lesions occur on the face, they can be particularly difficult to treat. A recent Med Page Today article highlights the most often recommended treatment for facial non-melanoma skin cancer, Mohs micrographic surgery (MMS). Joel Schlessinger MD and other cosmetic surgeons continue to recommend this procedure for their patients. What is Mohs micrographic surgery? Joel Schlessinger MD explains. When removing a skin cancer lesion, physicians must also remove tissue surrounding the lesion to ensure that the cancerous tissue is completely removed. This can be a difficult procedure on the smaller areas of the face such as the cheeks, forehead and ears. MMS allows surgeons to examine the margins around the lesion for greater accuracy when removing tissue. This type of procedure is beneficial because it allows the physician to preserve as much healthy tissue as possible. MMS is accepted today as one of the most effective procedures for removing basal cell carcinomas and squamous cell carcinomas, two of the most common types of skin cancer. If you are at all concerned about moles or lesions, see a dermatologist such as Joel Schlessinger MD. While MMS is one of the most often recommended treatments for facial skin cancer, there are other factors that must be considered during each individual case. A patient’s age, gender and history of skin cancer all must be considered when determining whether MMS is a suitable treatment option. The location of the lesion is also an important factor because certain areas on the face are at a greater risk of developing deeper lesions. Do you have questions for Joel Schlessinger MD? Let him know below. Stretch marks cannot be cured, but can be improved, explains Dr. Joel Schlessinger. While you can’t completely erase stretch marks, there are certain options that aid in softening their appearance. Many individuals dealing with this concern visit their dermatologist and receive a prescription for Retin-A, which works by stimulating cellular renewal. This prescription is ideal for those with oily complexions, but is suitable for most skin types. For those who are unsure about using Retin-A, there are plenty of other options. Topical stretch mark treatments are great alternatives to Retin-A products, according to Dr. Joel Schlessinger. SkinMedica Tri-Retinol Complex ES contains the highest non-prescription concentration of retinol allowed. This treatment boosts collagen production and elasticity to create a firmer, more youthful appearance. For a natural formula, Dr. Joel Schlessinger recommends Phytomer SeaTonic Stretch Mark Reduction Cream, which uses marine alternatives to improve stretch marks. StriVectin-SD Intensive Concentrate for Stretch Marks & Wrinkles uses niacin and peptides to help fade the appearance of stretch marks. Each of these products aid in lightening the color of stretch marks to create a more even skin tone. Regular use of these formulas will promote visible results. Dr. Joel Schlessinger also suggests in-office procedures to minimize stretch marks. Certain treatments and procedures such as Pellevé and the SilkPeel can also improve the appearance of these imperfections. 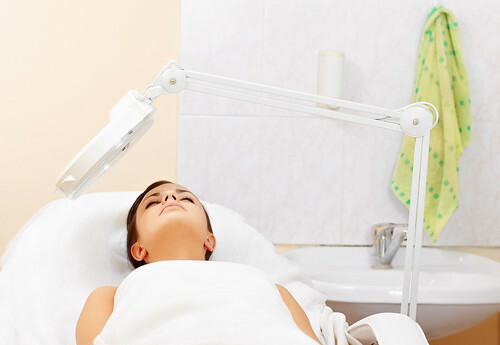 Pellevé is a non-invasive treatment that uses radiofrequency technology to increase collagen production and improve skin texture and appearance. It heats the skin to stimulate collagen and requires no anesthesia or downtime. SilkPeels are non-invasive treatments that deliver patient-specific solutions to the skin without crystal or chemical exfoliants. This procedure doesn’t cause irritation or inflammation as it brightens, hydrates and improves skin. Watch more videos from Dr. Joel Schlessinger on his YouTube channel.